After an almost 10-year hiatus, the Black Women’s Organization (BWO) is active once again. BWO will kick off its conference entitled “Connecting Our Minds, Liberating Our Souls and Breaking Our Chains” tonight. Originally founded in 1977, BWO is a politically based organization that fosters leadership within black women on campus. The group was extremely active up until its halt in 1995 and had its charter renewed just last year. BWO treasurer Christina Elliot ’17 added to this sentiment. “[We need more spaces for students to look up] to black women leaders on campus like faculty and staff and asking them how they navigated Wooster or any other predominantly white space,” making it a joint collaborative effort. However, efforts to reestablish BWO have not been easy. Rutledge and Elliot expressed frustration in having to constantly validate the organization’s purpose and significance to the larger campus community. Organizing the conference, on the other hand, turned out to be a much easier feat. For instance, Rutledge said that it was “almost too easy” booking the keynote speaker Jamilah Lemieux, senior editor of Ebony Magazine, whom she originally made contact with after following her on Twitter. 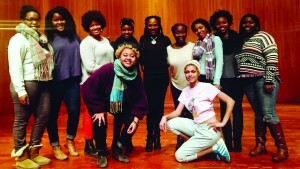 The same was said of securing participants for the poetry performance entitled Black Womyn Magic Show. Headlining the show will be CUPSI winner and world renowned poet Crystal Valentine, who is New York City’s current youth poet laureate. Alongside Valentine, Wooster alumna Ashley Jones ’14, Caira Lee ’16 and the newly formed RA Poetry Collective will also be performing. In addition to original BWO board members, Wooster can expect to be visited by some more recent alum. Among them include Antwan Chambers ’14, Deja Moss ’14, Bria Price ’14 and Erin Johnson ’14, all members who had an orginal hand in bringing back BWO prior to graduating just a few years ago. The conference will begin this evening with a documentary viewing of What Happened to Nina Simone? in Kauke 035 at 7:30 p.m.